Yes, it's confusing. And frames are annoying, in most cases. Hopefully, this situation is an exception. Here's some information that might help. If you don't see a frame to the left, click Here. The image below is this site on an optimized Netscape 4.5 browser. 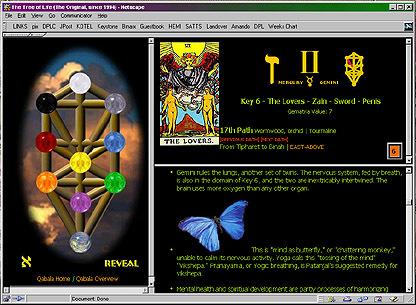 When viewing Tarot Trumps, you will see two windows in the right panel. The upper right window should have NO scrollbars, and the lower window scrolls. This way, the visual mnemonics remain in view while the commentary can be seen selectively. Control what you see in the right side by clicking on the Spheres or paths in the left window. There are also links in the commentary to pages that will appear in the right window(s). Clicking "Reveal" in the left window will show correspondences drawn on the Tree. Once there, clicking "Conceal" will hide them. 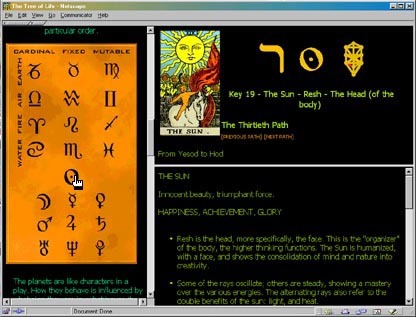 In the screen above, if you click on the letter "Aleph" in the lower left, the Glyphs page opens in the left screen. This page DOES have a scrollbar. There are several glyph-maps up and down this little page. Clicking on the glyphs in any of the maps opens the appropriate file in the right-side window(s), as shown below. On the Glyphs page, you bring back the Tree by clicking on "Tree." Clicking on "Qabala Home" or the small tree calls up the "Home" page, in this window. When you click on some links in the hyperpedia, a new browser window opens, and for some reason doesn't take over the desktop. You can toggle between browsers using alt-tab, or minimize the visible browser to reveal the new one beneath it. The links that do this are external links, or to larger images.